Brighton & Hove Albion defender Lewis Dunk will make his England debut this evening after being named in the starting line-up against the United States. The 26-year-old will start alongside Everton's Michael Keane in the centre of defence, while Bournemouth striker Callum Wilson will also make his debut and former Albion loanee Jesse Lingard also starts. Dunk will wear the number six shirt. Dunk was named in his second Three Lions squad earlier this month for tonight's game and Sunday's Nations League match with Croatia. He had been a late call-up to the squad last month for Nations League games with Croatia and Spain. Speaking after Brighton's defeat at Cardiff on Saturday, Dunk said it would be a dream come true to make his England debut this week. He will become the first Brighton player since Steve Foster in 1982 to represent England. Tommy Cook and Peter Ward are the other players to have pulled on the Three Lions shirt while playing for Albion. 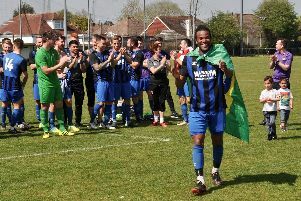 Dunk has played more than 240 matches for Albion, helping the club win promotion into the Premier League in 2017 and then starring as they stayed up last season. As a youngster, he spent time on loan at Bognor Regis and also played two games on loan at Bristol City in a brief loan spell in 2013. In tonight's matchday programme, Dunk's player profile reads: "Calm and composed, Dunk has been a mainstay of the Brighton side since their promotion to the Premier League and continues to impress under Chris Hughton on the south coast. "Received his first call-up as a replacement last month. "I'm sure he'll be better for that experience", said his manager." The England line-up is: Pickford; Alexander-Arnold, Keane, Dunk, Chilwell; Delph, Winks; Sancho, Alli, Lingard; Wilson. Subs: Rooney, Kane, Butland, Walker, Henderson, Sterling, Barkley, Rashford, Stones, McCarthy, Dier, Loftus-Cheek. United States line-up: Guzan; Yedlin, Miazga, Brooks, Villafana; Trapp, McKennie; Pulisic, Green, Weah; Wood. Subs: Horvath, Adams, Carter-Vickers, Delgado, Lletget, Saief, Moore, Acosta, Cannon. Seagulls Weekly Podcast: Did 10-man Albion deserve something against Cardiff? Is it time for VAR in the Premier League?